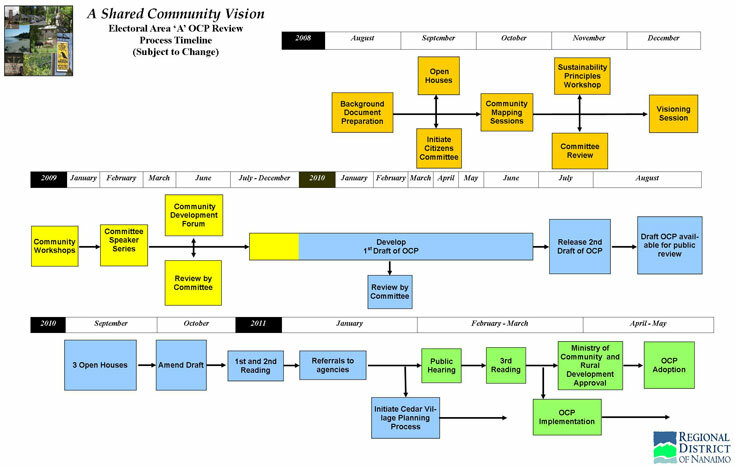 The following diagram outlines the Electoral Area 'A' Official Community Plan review process. The Electoral Area 'A' Official Community Plan was adopted by the Regional District of Nanaimo Board on Tuesday, July 26, 2011. The notices and information below represent a record of the public engagement and events of the Official Community Plan review. 'A Shared Community Vision'Community Information Meeting and Public Hearing Electoral Area 'A' Official Community Plan ReviewCommunity Information Meeting and Public Hearing. The draft Official Community Plan received 1st and 2nd reading at the February 22nd Board meeting. A workshop was held in South Wellington on November 23rd at the Cranberry Community Hall to discuss a potential expansion to the South Wellington Industrial Commercial Area as well as to find out if there was support in the community for a small rural neighbourhood centre. The following provides information which was available at the workshop as well as a summary of the workshop proceedings. A meeting was held in Cassidy on November 12, 2009 at the Western Maritime Institute to obtain community input on a potential expansion to the Cassidy Rural Village. The RDN and Island Timberlands gave separate presentations and then meeting participants were asked to fill out a questionnaire. The following provides information which was available at the meeting as well as the results of the questionnaire. A Community Development Forum was held on June 15th at the Cedar Community Hall. Approximately 150 people attended the Forum, which provided an opportunity for developers, Electoral Area 'A' residents, and those with an interest in the area to get together to share information and discuss some of the upcoming and on-going development projects in Electoral Area 'A'. In addition, the forum provided an opportunity for developers to obtain valuable community input on their projects. Presentations were made at the forum for the following developments. During the Forum, participants were provided an opportunity to fill out evaluation forms. The results have been tabulated and are provided below. Following the Community Workshops the OCP Review Citizen's Committee held five meetings on specific issues related to the Official Community Plan Review. The purpose of these meetings was to provide background information, to get the Committee and the community to start thinking about the topics, and to solicit community feedback and obtain specific direction on each topic. The community was invited to provide input on a number of different policy options by completing a series of five workbooks. There was a different workbook for each of the five meetings, which are provided in the table below. All Committee meetings were open to the general public. There were also guest speakers in attendance at each meeting to provide background information on the topic and there will be an opportunity for questions and discussion. Please see the table below for a list of speaker series meetings and workbook results. As part of the Electoral Area 'A' Official Community Plan review process, four workshops were held to develop goals and objectives that help us achieve 'A Shared Community Vision'. Click on the links below for more information on each meeting. 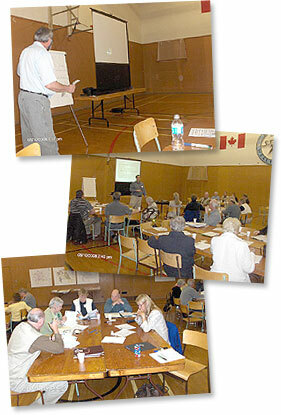 As part of the Electoral Area 'A' Official Community Plan review process, a Visioning Workshop was held on December 6, 2008 to develop a shared community vision. Approximately 50 people attended the workshop, which provided a diverse range of community ideas, discussion, and comments. The intent of the community vision is to articulate the future desired characteristics of Electoral Area 'A' based on the input from the community. The purpose of the Visioning Workshop was to ask participants to consider a number of questions including: What do you like about your community now and what do you want more of in 25 years? Approximately 60 people attended the workshop held on November 17, 2008 which was a critical component of the Official Community Plan review. The purpose of the workshop was to develop a set of sustainability principles applicable to Electoral Area 'A' that will provide the framework for sustainable decision making during the Official Community Plan review process and following the adoption of a new Official Community Plan. The input provided by the community at the Sustainability Principles workshop, has formed the basis for drafting 15 sustainability principles. Sustainability principles are high level broad statements that form the framework for making effective decisions and provide guidance in the formation of goals, objectives, and policies. Approximately 100 people attended the three Open Houses which were held at the Western Maritime Institute on September 15, at the Cranberry Community Hall on September 16, and at the Cedar Community Hall on September 17. The purpose of the Open Houses was to provide background information on Electoral Area 'A' and to discuss the process for the Official Community Plan review. The Open Houses also provided an opportunity to obtain information on how to participate in the review and how to stay informed about the process. To kick off the OCP review process and raise awareness. To share information about and discuss sustainability and community planning. To provide an overview of the current OCP. To determine what the community would like to see included in the OCP review. To obtain input on how the community would like to be involved in the OCP review. To determine suitable methods informing the community on progress and upcoming events related to the OCP review. We wish to thank everyone who attended the Community Forum. There was some great discussion and many suggestions on how we can develop a comprehensive Official Community Plan review process which will encourage participation from a broad range community members, which addresses community needs, is transparent and rationale, and which leads us towards creating an Official Community Plan which reflects the needs of the community. A few general themes emerged from the Community Forum including the need to overhaul the existing OCP, a desire to focus more on sustainability (environmental, Social, and Economic), a need to use clear concise and understandable language, and a desire to maximize opportunities for community involvement in the process. The following list includes a summary of the community presentations as well as a summary of the responses from the small group discussions.